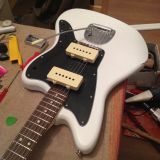 It just came in, quite nice quality for china overall..nice modding platform ..for 200 Euros. 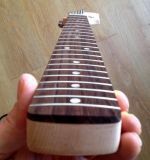 checking the wood, really light for alder..if it was basswood I would have returned it ..
cleaning out the neck pocket..
neck is on the slimmer side, like it! 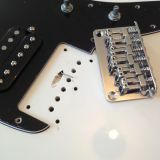 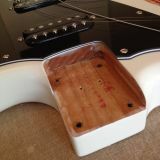 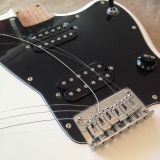 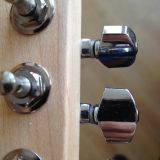 bigger chinese pots, wiring is ok..
bridge is a cheaper cast metal one, but intonating good..
you could easily drill some holes for a new bridge and do a tremolo..
frets are basically ok, I do this on any of my guitars, polishing and rounding the edges a bit..
yeah, the pool route makes it somewhat easier.. 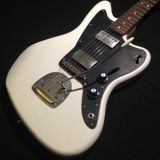 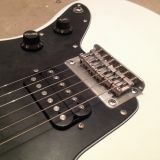 I had a Mascis Trem lying around..I hacked the trem cavity with wood knives as I dont have a router, but what the heck..
the JM pickup covers came, too, I think I�ll spray them black..
the pickguard originally was cut around the bridge, you can see this in my third posts pics..
the pickguard is off and the trem still is on top. 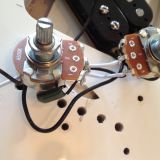 closed the pickup holes and installed some nice and cheap Vanson Alnico II humbuckers..
plays nice..the tremolo ringing overtones are there, but a little bit less than with my old VMJM ..